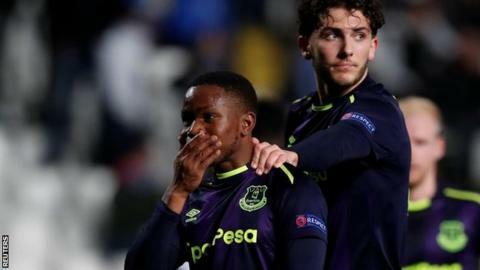 Ademola Lookman scored twice as a weakened Everton team beat Apollon Limassol to end their failed Europa League campaign with their only win. With Sunday's Liverpool derby in mind, the Toffees made 11 changes from the victory over Huddersfield, while manager Sam Allardyce did not travel because of a medical appointment. Lookman headed in Nikola Vlasic's cross from close range and fired in a 25-yard second for the already eliminated Toffees, who gave debuts to five youngsters. Vlasic added a late third, nipping the ball past Apollon's defence to slot home. Everton have won three games in a row, all under different managers - caretaker boss David Unsworth, Allardyce and, in Cyprus, newly appointed first-team coach Craig Shakespeare. Victory means they do not finish bottom of the group, overtaking winless Apollon, and avoid becoming the first English team to not win a Europa League group game. Atalanta won Group E, courtesy of a 1-0 win over Lyon, who gave 45 minutes to forward Willem Geubbels. At 16 years and four months he is the youngest player to feature in European competition in 10 seasons. None of the 11 players who started in Nicosia are likely to line up against Liverpool at Anfield, but Lookman will have improved his chances of being involved from the bench on Sunday (14:15 GMT). The 20-year-old had not scored in his previous 20 matches, a run going back to his only other goal for the club, a debut strike against Manchester City in January. He had a bright first half, and could have scored earlier after being picked out by a wonderful Davy Klaassen pass. The former Charlton player took too long on the ball, switching feet and shooting at keeper Tasos Kissas. But he made no mistake with their opening goal, heading into the roof of the net from Vlasic's cross after the young Croat's one-two with Kevin Mirallas. Lookman smashed home a wonderful second from outside the box, from Mirallas' pass, with Kissas only able to parry it into the top corner. After the break, he had one hat-trick chance but was denied by the keeper from a wide angle with Vlasic - another 20-year-old - free in the centre four yards from goal. Vlasic - whose only previous Everton goal had been against Apollon at home - scored a late third after using his pace to run in on goal before placing the ball through the legs of Kissas. Everton handed debuts to two players from the start - Scotland Under-19 striker Fraser Hornby and Republic of Ireland Under-21 player Harry Charsley, who featured at left-back. Charsley, usually an attacking midfielder, was lively going forward, and forced Kissas into a good save with a curling effort from 20 yards. But the Toffees were shaky at the back in early stages, with 18-year-old Morgan Feeney - making his first start - the only regular defender in the back four. Joel Robles had to make several saves after poor defending, with Fotis Papoulis, Adrian Sardinero and Allan denied by the keeper and Papoulis having a goal ruled out for offside. However, the Toffees improved at the back after the break and held out for a clean sheet. Hornby did not see much of the ball, but showed some decent touches as the main striker. None of the seven Everton substitutes had any first-team experience. Nathan Broadhead, a Wales Under-21 forward, replaced Hornby with 10 minutes left and Anthony Gordon, 16, and England Under-17 midfielder Alex Denny came on late on. The average age of Everton's starting XI (23 years 15 days) was the youngest by an English club in Europe (excluding qualifiers) since their game against BATE Borisov in the same competition in December 2009 (22 years 319 days). Only one English team have picked up fewer points than Everton's four in a European group stage - Manchester City with three in the 2012-13 Champions League. Everton have won three successive matches in all competitions - the same tally of wins they recorded in their previous 20 competitive matches combined. The Toffees have also kept a clean sheet in each of their past three competitive matches - this after conceding in each of their previous 13 games before this run (32 goals). Anthony Gordon (16 years 286 days) became only the second 16-year-old to play for an English club in the Europa League, after Jake Bidwell (for Everton vs BATE in December 2009). Everton first-team coach Craig Shakespeare: "As young players they need that opportunity but they also need to show the ability… and Lookman did. "To come away from home, to keep a clean sheet and score three, the team have to take enormous credit for that. "But we have said to the squad look at this as a starting block and in football you get your just rewards most of the time. "I thought we played some really good stuff in the first half and with a little bit more care in front of goal could have scored more. I have really enjoyed working with them and you saw tonight the work ethic and ability, and how we approached the game." Match ends, Apollon Limassol 0, Everton 3. Second Half ends, Apollon Limassol 0, Everton 3. Attempt missed. Emilio Jose Zelaya (Apollon Limassol) right footed shot from the left side of the box is close, but misses to the right. Assisted by Andrei Pitian following a corner. Corner, Apollon Limassol. Conceded by Alex Denny. Substitution, Everton. Alex Denny replaces Harry Charsley. Substitution, Everton. Anthony Gordon replaces Kevin Mirallas. Goal! Apollon Limassol 0, Everton 3. Nikola Vlasic (Everton) left footed shot from the centre of the box to the bottom left corner. Substitution, Everton. Nathan Broadhead replaces Fraser Hornby. João Pedro (Apollon Limassol) wins a free kick on the right wing. Foul by Esteban Sachetti (Apollon Limassol). Fotis Papoulis (Apollon Limassol) wins a free kick in the attacking half. Esteban Sachetti (Apollon Limassol) is shown the yellow card for a bad foul. Nikola Vlasic (Everton) wins a free kick in the attacking half. Attempt missed. Andrei Pitian (Apollon Limassol) right footed shot from more than 35 yards is too high. Assisted by Esteban Sachetti. Foul by Andrei Pitian (Apollon Limassol). Fraser Hornby (Everton) wins a free kick in the defensive half. Substitution, Apollon Limassol. Ioannis Pittas replaces Nicolás Martínez. Attempt missed. Morgan Schneiderlin (Everton) header from the centre of the box misses to the left. Assisted by Kevin Mirallas with a cross following a set piece situation. Foul by Allan (Apollon Limassol). Beni Baningime (Everton) is shown the yellow card. Attempt saved. Fraser Hornby (Everton) right footed shot from the centre of the box is saved in the centre of the goal. Foul by Fotis Papoulis (Apollon Limassol). Nicolás Martínez (Apollon Limassol) wins a free kick in the defensive half. Attempt blocked. Allan (Apollon Limassol) left footed shot from outside the box is blocked. Assisted by Fotis Papoulis. Delay in match Andrei Pitian (Apollon Limassol) because of an injury. Emilio Jose Zelaya (Apollon Limassol) wins a free kick in the attacking half. Foul by Morgan Feeney (Everton). Substitution, Apollon Limassol. Antonio Jakolis replaces Adrián Sardinero. Substitution, Apollon Limassol. Emilio Jose Zelaya replaces André Schembri.